← There’s an Apple Tree in My Office, Dear Liza, Dear Liza…. Since I’ve been showing off my grafted tomatoes, I guess I’d better share what the Master Gardeners are going to be doing in the Demonstration Garden for tomatoes this year! We are going to be planting a whole bed to heirloom tomatoes to see if the tomato grafting improves the yield and resistance to nematodes in our garden. We’ll be planting the tomatoes 24″ apart and we’ll use the stake & weave system rather than cages. We’ll have 6 grafted heirloom plants and 6 non-grafted heirloom plants. There will be 3 varieties, with 2 plants of each in both the grafted and the non-grafted part of the demonstration. 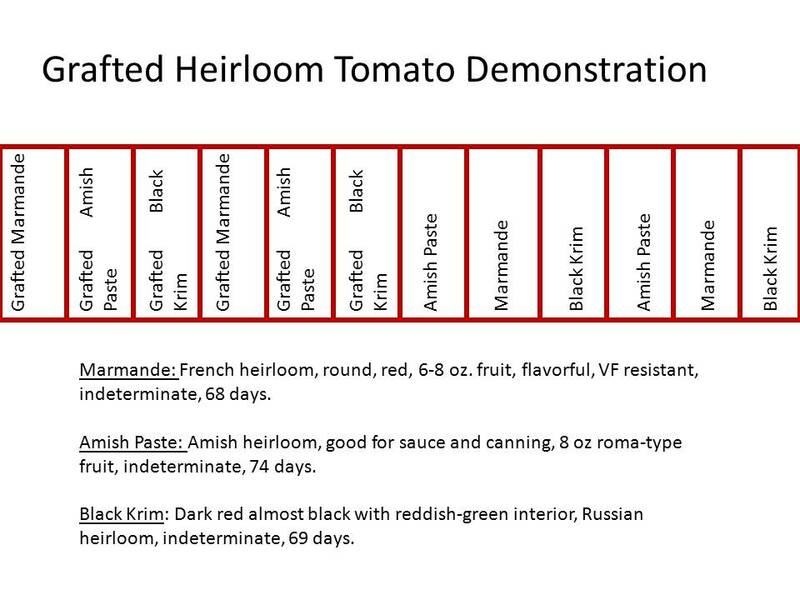 We chose 3 different heirlooms, with one of the main factors in the variety selection being how many days to harvest. We wanted varieties that were earlier maturing in case we have another summer like this past summer! Posted on February 15, 2011, in Around the Garden and tagged Garden plan, garden planning, Tomatoes. Bookmark the permalink. 3 Comments. So the reason to graft tomatoes is to increase disease resistance? By the way, you might want to consider getting some seeds from Arkansas Traveller tomatoes – my favorite heirloom for Kansas weather conditions. It continues setting fruit long after others have quit when the weather gets hot, it drought tolerant, and the tomatoes are delicious. Yes, the primary reason is to provide disease/nematode resistance. The secondary reason is that we hope to provide more vigor and yield for the heirloom varieties. I did think about the Arkansas Traveler…maybe we’ll grow that one next time.